November 14, 2012: The Dinosaur Statues at the Evolution Park at the Science and Technology Museum premises will be inaugurated today in connection with the Children's Day. 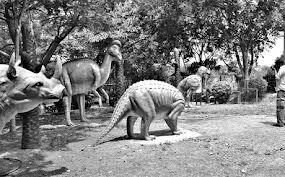 Fifteen Dinosaur statues are displayed in the park out of which seven can move using numeric technology. The mechanically operated Dinosaurs include models of Scelidosaurus, Triceratops, Dimetrodon, Stegosaurus, Pteranodon, Psittacosaurus, Velociraptor, Glyptodon, Woolly Rhinoceros and Diatryma. Other attractions at the park include statue of the 'The Archaeopteryx', Light and sound show, musical fountain etc. The park has been constructed at a cost of Rs. 45 Lakhs with the help of Kolkata Science City and Vishweshwarayya Museum, Bangalore.